Hi, my name is Robin Gudgel. I’m the mechanical design engineer responsible for the designs of the products shown above. I will attempt to explain a brief history of Renewable energy (RE) breaker boxes, why they are so different, and how it all relates and has evolved into the newest entry into the RE industry; the E-Panel. Why can’t we just go to Home Depot for the required over current protection and disconnect? For the AC section you can (sort of). The breakers used in the AC section of an Renewable Energy system can be standard 120VAC branch circuit rated circuit breakers. In a normal grid connected home, there is only one source of AC power that gets distributed to many different circuits in the home. 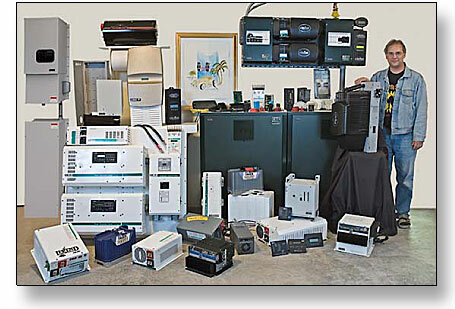 In a Renewable Energy home and some grid connected homes, there can be numerous AC sources, the grid, a back up AC generator and an inverter. This means that up to three different circuits exist for the AC source. They cannot simply be connected all together. In addition to the AC source, there are sometimes separate load circuits. Some circuits such as the hot tub or tennis court lights may want to be on a circuit that is not backed up by the inverter. Hot tubs are famous for sucking a battery bank dry in no time flat. Critical loads need to be connected to the inverter AC output. In many instances this is the entire house when dealing with an off-grid home. There are additional AC circuits that do not fit into either category. OutBack Power Systems has a unique product called the “X-240” and “PSX-240”. These auto-transformers have the ability to transfer power from leg 1 to leg 2 and visa versa. That device requires its own breakers and further complicates the AC circuit. This gives us the potential for six different AC circuits. There is no standard AC distribution box available from Home Depot that can do all this. It would take several separate boxes and even then, some of them are not commonly available such as bypass switch boxes.